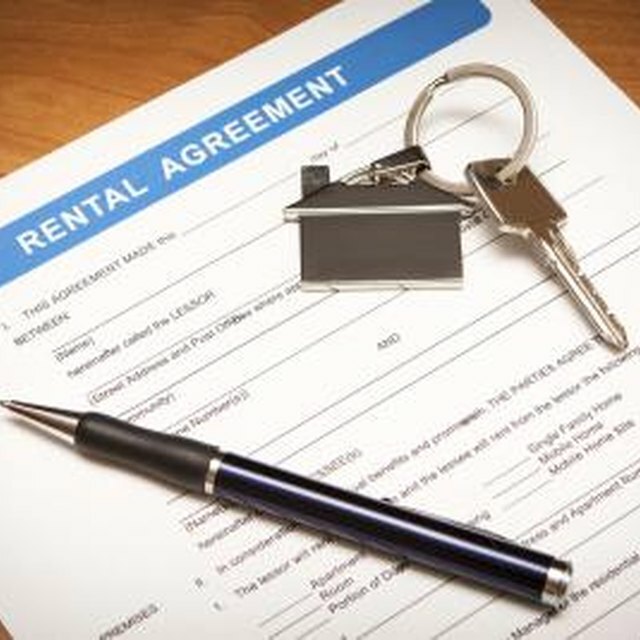 Renting a place to live requires an agreement between you and the landlord, and this agreement -- usually in written form -- specifies the rights and obligations of all parties. If you fail to honor the terms of the agreement, such as not paying the rent, the landlord may initiate an eviction to legally remove you from the premises. Information related to an eviction has the potential to impact your credit for several years. The term "eviction" doesn't appear on your credit report, according to Experian. But other data related to your eviction might show up. For example, the property management company may report the unpaid debt as delinquent to the credit bureaus. Such negative accounts can stay on your credit report for up to seven years. If you later pay the rental debt, that payment will not remove the negative account any earlier. Debt from an eviction can appear on your credit report in another way. If you have an unpaid balance owed on your rental lease, the landlord may turn the rental debt over to a collection agency, and that collection account may appear on your credit report. A collection account can also remain on your credit report for up to seven years. Paying the collection will not cause the bureau to delete it from the credit report. Instead, the bureau will update the status of the collection account to "paid" or "settled," whichever applies in your case. If the collection account is included in a bankruptcy, the account status will reflect the bankruptcy but the account history will remain on your credit report. Depending on how much you owe, the landlord may pursue legal action in civil court to recoup the rental debt. If the landlord sues you for the unpaid rental debt, the court can issue a judgment against you. This judgment will appear on your credit report as a public record. Judgments remain on your credit report for up to seven years. As with a collection account, payment of a judgment will not remove it from your credit report. Judgments included in bankruptcy are removed from the report once the bankruptcy is discharged, according to Experian. When it comes to your credit report, you do have rights. The Fair Credit Reporting Act regulates how information is reported to the credit bureaus. Collections, judgments and delinquent accounts from unpaid rent cannot stay on your report for longer than seven years. Unfortunately, credit bureaus don't always update their databases as fast as you'd like them to. Eviction-related information on a credit report can prevent a new landlord from renting to you, so if you discover expired data on your report, you can dispute it with the bureaus by phone, mail or online at the bureau's website. The bureau then has up to 30 days to investigate your dispute and remove the item. Under the FCRA, you can get a free copy of your credit report once a year from each bureau at the AnnualCreditReport website.